Over extension slides provide an extra extension of the drawer box so that the back of the drawer is still accessible even when something like a countertop over hangs above the drawer. Thanks to OVIS over extension drawer slides, you can have full visibility for the contents of your drawers with all the reliability and durability you’ve come to expect. The Hettich KA 4932 over extension drawer slides have 1-1/2" of over extension so that the back of the drawer box extends past the face of the cabinet by 1-1/2". When you need extra accessibility to you drawers, the KA 4932 over extension drawer slides provide the solution whether it's a file drawer, kitchen silverware drawer, or an industrial or office application. Sometimes a countertop will come with a lip that hangs over the edge of the body of the cabinet. This can make it difficult to for someone see or access the rear contents of a drawer, even when it is fully extended. The over extension drawer slides make drawers capable of extending past their normal extension point and beyond the face of the cabinet -- without falling off track. This design allows access to the entirety of the drawer with ease. Anyone replacing their drawer slides because their old one broke won't have to worry about facing any issues with OVIS over extension drawer slides. These drawer slides are made of solid steel. Combined with their high-quality design, over extension drawer slides will last for many years. To learn more about OVIS drawer hardware solutions, including the over extension drawer sliders, feel free to browse our products online or contact our team today. 10" Over Extension Drawer Slides, 130 lb. The Hettich/Grant KA 4932 ball bearing 10" over extension drawer slides are a telescopic precision over extension slide with cushioned in and out stops and positive hold-in detent. 12" Drawer Slides, Over Extension, Heavy Duty 200lb. 12" Telescoping precision over extension slides for high loads, up to 200 lb. capacity, with cushioned in and out stops. Chromated steel. Smooth action and high side stability through precision ball bearings. Price is per pair. Screws not included. 12" Over Extension Drawer Slides, 130 lb. The Hettich/Grant KA 4932 ball bearing 12" over extension drawer slides are a telescopic precision over extension slide with cushioned in and out stops and positive hold-in detent. 14" Drawer Slides, Over Extension, Heavy Duty 200lb. 14" Telescoping precision over extension slides for high loads, up to 200 lb. capacity, with cushioned in and out stops. Chromated steel. Smooth action and high side stability through precision ball bearings. Price is per pair. Screws not included. 14" Over Extension Drawer Slides, 130 lb. 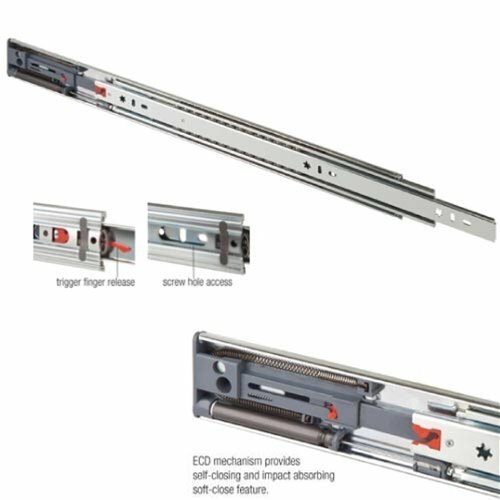 The Hettich/Grant KA 4932 ball bearing 14" over extension drawer slides are a telescopic precision over extension slide with cushioned in and out stops and positive hold-in detent. The Hawthorne & Reid HR2054160001 16" heavy duty drawer slides have a 220 lb. weight capacity. They have a 1? over travel to allow extra access to the back of the drawer. The center member has a channel to allow clearance for a pan head screw to be used to attach the cabinet member to the cabinet. 16" Drawer Slides, Over Extension, Heavy Duty 200lb. 16" Telescoping precision over extension slides for high loads, up to 200 lb. capacity, with cushioned in and out stops. Chromated steel. Smooth action and high side stability through precision ball bearings. Price is per pair. Screws not included. 16" Over Extension Drawer Slides, 130 lb. The Hettich/Grant KA 4932 ball bearing 16" over extension drawer slides are a telescopic precision over extension slide with cushioned in and out stops and positive hold-in detent. The Hawthorne & Reid HR2054180001 18" heavy duty drawer slides have a 220 lb. weight capacity. They have a 1? over travel to allow extra access to the back of the drawer. The center member has a channel to allow clearance for a pan head screw to be used to attach the cabinet member to the cabinet. 18" Drawer Slides, Over Extension, Heavy Duty 200lb. 18" Telescoping precision over extension slides for high loads, up to 200 lb. capacity, with cushioned in and out stops. Chromated steel. Smooth action and high side stability through precision ball bearings. Price is per pair. Screws not included. Fulterer FR5210.ECD, 18 inch soft close heavy duty (200 lb.) 1" over extension drawer slide. These drawer slides are ideal filing cabinets, office furniture, architectural millwork and commercial applications where a heavy capacity is needed. 18" Over Extension Drawer Slides, 130 lb. The Hettich/Grant KA 4932 ball bearing 18" over extension drawer slides are a telescopic precision over extension slide with cushioned in and out stops and positive hold-in detent. The Hawthorne & Reid HR2054200001 20" heavy duty drawer slides have a 220 lb. weight capacity. They have a 1? over travel to allow extra access to the back of the drawer. The center member has a channel to allow clearance for a pan head screw to be used to attach the cabinet member to the cabinet. 20" Drawer Slides, Over Extension, Heavy Duty 200lb. 20" Telescoping precision over extension slides for high loads, up to 200 lb. capacity, with cushioned in and out stops. Chromated steel. Smooth action and high side stability through precision ball bearings. Price is per pair. Screws not included. Fulterer FR5210.ECD, 20 inch soft close heavy duty (200 lb.) 1" over extension drawer slide. These drawer slides are ideal filing cabinets, office furniture, architectural millwork and commercial applications where a heavy capacity is needed. 20" Over Extension Drawer Slides, 130 lb. The Hettich/Grant KA 4932 ball bearing 20" over extension drawer slides are a telescopic precision over extension slide with cushioned in and out stops and positive hold-in detent. The Hawthorne & Reid HR2054220001 22" heavy duty drawer slides have a 220 lb. weight capacity. They have a 1? over travel to allow extra access to the back of the drawer. The center member has a channel to allow clearance for a pan head screw to be used to attach the cabinet member to the cabinet. Telescoping precision over extension slides for high loads, up to 200 lb. capacity, with cushioned in and out stops. Chromated steel. Smooth action and high side stability through precision ball bearings. Price is per pair. Screws not included. Fulterer FR5210.ECD, 22 inch soft close heavy duty (200 lb.) 1" over extension drawer slide. These drawer slides are ideal filing cabinets, office furniture, architectural millwork and commercial applications where a heavy capacity is needed. 22" Over Extension Drawer Slides, 130 lb. The Hettich/Grant KA 4932 ball bearing 22" over extension drawer slides are a telescopic precision over extension slide with cushioned in and out stops and positive hold-in detent. The Hawthorne & Reid HR2054240001 24" heavy duty drawer slides have a 220 lb. weight capacity. They have a 1? over travel to allow extra access to the back of the drawer. The center member has a channel to allow clearance for a pan head screw to be used to attach the cabinet member to the cabinet. 24" Drawer Slides, Over Extension, Heavy Duty 200lb. 24" Telescoping precision over extension slides for high loads, up to 200 lb. capacity, with cushioned in and out stops. Chromated steel. Smooth action and high side stability through precision ball bearings. Price is per pair. Screws not included. Fulterer FR5210.ECD, 24 inch soft close heavy duty (200 lb.) 1" over extension drawer slide. These drawer slides are ideal filing cabinets, office furniture, architectural millwork and commercial applications where a heavy capacity is needed. 24" Over Extension Drawer Slides, 130 lb. The Hettich/Grant KA 4932 ball bearing 24" over extension drawer slides are a telescopic precision over extension slide with cushioned in and out stops and positive hold-in detent. The Hawthorne & Reid HR2054260001 26" heavy duty drawer slides have a 220 lb. weight capacity. They have a 1? over travel to allow extra access to the back of the drawer. The center member has a channel to allow clearance for a pan head screw to be used to attach the cabinet member to the cabinet. 26" Over Extension Drawer Slides, 130 lb. The Hettich/Grant KA 4932 ball bearing 26" over extension drawer slides are a telescopic precision over extension slide with cushioned in and out stops and positive hold-in detent. The Hawthorne & Reid HR2054280001 28" heavy duty drawer slides have a 220 lb. weight capacity. They have a 1? over travel to allow extra access to the back of the drawer. The center member has a channel to allow clearance for a pan head screw to be used to attach the cabinet member to the cabinet. 28" Drawer Slides, Over Extension, Heavy Duty 200lb. 28" Telescoping precision over extension slides for high loads, up to 200 lb. capacity, with cushioned in and out stops. Chromated steel. Smooth action and high side stability through precision ball bearings. Price is per pair. Screws not included. 28" Over Extension Drawer Slides, 130 lb. The Hettich/Grant KA 4932 ball bearing 28" over extension drawer slides are a telescopic precision over extension slide with cushioned in and out stops and positive hold-in detent. The Hawthorne & Reid HR2054300001 30" heavy duty drawer slides have a 220 lb. weight capacity. They have a 1? over travel to allow extra access to the back of the drawer. The center member has a channel to allow clearance for a pan head screw to be used to attach the cabinet member to the cabinet. Fulterer FR5210.ECD, 26 inch soft close heavy duty (200 lb.) 1" over extension drawer slide. These drawer slides are ideal filing cabinets, office furniture, architectural millwork and commercial applications where a heavy capacity is needed. Fulterer FR 5609, 400mm/16 inch heavy duty (225 lb.) 1" over extension drawer slides. These drawer slides are ideal filing cabinets, office furniture, architectural millwork and commercial applications where a heavy capacity is needed. The Fulterer FR 5432, 1000 Mm/39.37" 150% Over Extension Heavy Duty Drawer Slide that has a travel of 59.65". They have a load rating of 308 lbs. and have steel ball bearings. This is a non-detachable slide. The Fulterer FR 5432, 900 Mm/35.43" 150% Over Extension Heavy Duty Drawer Slide that has a travel of 53.74". They have a load rating of 352 lbs. and have steel ball bearings. This is a non-detachable slide. The Fulterer FR 5426, 1000 Mm/39.37" Super Heavy Duty Drawer Slide. They have a load rating of 550 lbs. and have stainless steel ball bearings. This is a non-detachable slide. The Fulterer FR 5426, 900 Mm/35.43" Super Heavy Duty Drawer Slide. They have a load rating of 610 lbs. and have stainless steel ball bearings. This is a non-detachable slide. The Fulterer FR 5426, 600 Mm/23.62" Super Heavy Duty Drawer Slide. They have a load rating of 770 lbs. and have stainless steel ball bearings. This is a non-detachable slide.